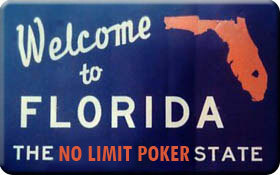 July 1st 2010 marked a new day for Florida poker players; this was the day that the $100 buy-in limit was removed, and Florida players were finally allowed to play some ‘real’ poker. So how successful has the new legislation been? The Sun Sentinel reports that poker revenue in July was up 35% over June’s numbers — $11.3 million in July compared to $8.4 million in June. Florida poker rooms not only have larger games, but restrictions on hours have also been removed, allowing poker-rooms to now stay open for 18 hours on weekdays, and 24 hours on weekends, instead of the 12-hour restrictions in place before July 1st –and obviously more hours = more rake collected! These numbers also don’t include the Seminole Casinos in the state, which more than likely have seen big increases in their poker revenue. The typical Rake in Florida card-rooms is 10% up to a maximum of $5, a little stiffer than some other locales, so it’s no wonder the increase in stakes and buy-ins has been a boom to the Florida poker scene: Could you imagine playing a $100 buy-in game with a $5 rake at $50! This entry was posted on Friday, August 20th, 2010 at 10:53 am and is filed under Poker News. You can follow any responses to this entry through the RSS 2.0 feed. You can leave a response, or trackback from your own site.